Database Systems Corp. (DSC) has been a leading provider of computer and telephony products since 1978. DSC offers both automatic phone answering services and the latest technology in office phone systems. This technology from DSC can automate your sales process, streamline fee collections, and improve the productivity of your collections department. Your clients will now have the option to pay their bills by phone, 24 hours a day. Our automatic phone answering system with IVR (Interactive Voice Response) software lets your clients call an 800 number to pay their bills or fees. How Does Our Bill Pay Service Work? Payment by phone using our automated phone service is easy to use and implement. This feature can be embedded in a normal phone sales process or can be a standalone application dedicated to bill or fee payment. Here is one example of an application of this powerful fee collection tool. Customers are provided an 800 number to call for bill payment. DSC call center answers calls and provides custom greetings and selection menus. The phone system automatically collects an account number used to access account information. The system accesses the client's account information over a secured network. Using text to speech technology, account information is converted. DSC IVR provides your clients their account balance or subscription fee info. The system automatically transmits this information to an accredited card processing service. The DSC IVR system returns this information to your accounting department. This process can be customized to meet your specific bill payment requirements. Contact DSC to learn more about our automatic bill payment services and phone systems. Ankida has contracted with DSC to provide phone services including automatic payment collection by credit card using our IVR technology. Subscribers call Ankida's 800 number to match paying customers with its adviser groups. 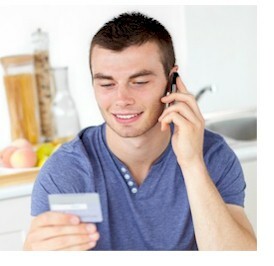 Callers are required to enter a valid credit card to get advise over the phone. Our automatic bill pay IVR gathers credit card type, number and amount and processes the payment transaction using an accredited service. Besides offering a comprehensive bill payment phone service, DSC offers an affordable and expandable IVR phone system. DSC maintains a professional staff of IVR programmers that can develop a custom bill payment solution for your organization. Our entry level phone is a 4 analog line IVR system which includes our simple WIZARD setup program or comes optionally with our comprehensive IVR Software development toolkit. If your bill payment or collections center requires more lines, our PACER IVR system can be used in environments where hundreds to thousands of digital phone lines are supported. The following are some of the features of this automatic payment service. Contact DSC to learn more about our bill payment service over the phone.